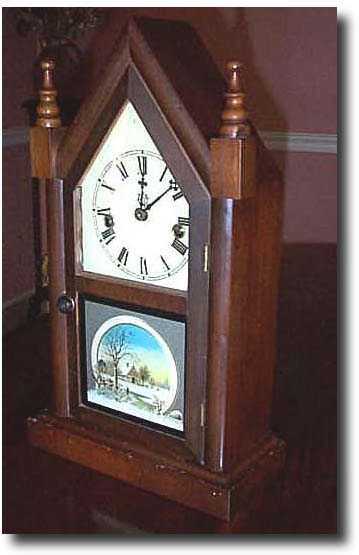 Small Waterbury "Small Gothic" Steeple Mantel Clock This clock is in wonderful condition. It is listed 712 by Tran Duy Lu and is dated to 1867. The case is mahogany veneer with the veneer all in place and in good condition. The face is marked with the Waterbury logo and other than some crazing, looks very nice. The reverse painted glass is also intact. I do not know if either of the glass pieces are original, but none-the-less, they are in good shape. The mechanism is one-day time and strike, which counts the hours. The original label is fully intact on the back. The clock is keeping good time. It stands 14 inches high.